Tucked behind the bushes in an inconspicuous garden by Hong Kong’s harbor front is a white marble plaque resembling a tombstone. On closer inspection, the words “A Time Capsule of Some Day” are engraved on it. “A time capsule is something very personal. Different people have different ideas of what to put in a time capsule as a reminder of the past,” says Morgan Wong, the Hong Kong artist behind the plaque. Buried beneath the plaque is Wong’s time capsule, a glass tube filled with steel powder. Inspired by the Chinese idiom “to grind an iron bar down to a small needle,” which means persevering with a difficult task, he continues to grind down a massive steel bar everyday, and collects the powder to put into needle-shaped tubes like the one he buried. Since 2016, Wong has made more than 200 variations of Time Needle, each containing powder collected from the steel bar. The project, he says, is a symbol of the struggles of Hong Kong people in the face of a multitude of challenges. The months-long Umbrella Movement protests of 2014, in which people occupied the streets calling for greater democracy, is one such struggle that comes to mind. 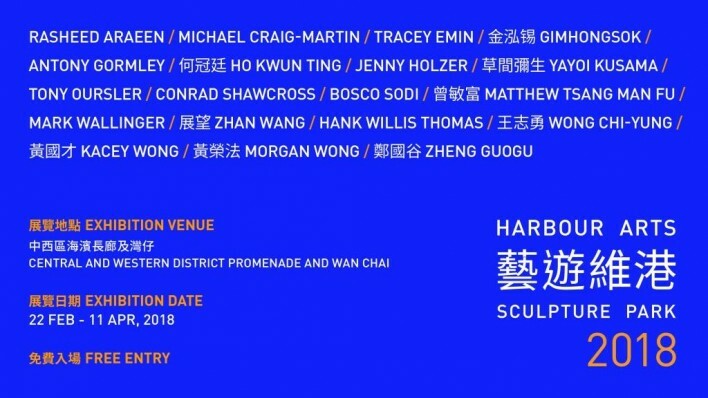 Time Needle (A Time Capsule of Some Day) is the 34-year-old artist’s latest work, and is being displayed in the Harbour Arts Sculpture Park, an expansive exhibition of 21 public sculptures by a mix of international and Hong Kong artists on show until April 11. Other pieces being exhibited include a signature pumpkin installation by Yayoi Kusama, Antony Gormley‘s DAZE VI (2016), and Tracey Emin’s A Moment Without You (2017), a sculpture of birds perched on thin poles said to be the artist’s tribute to her late friend, Hong Kong tycoon and cultural icon David Tang. 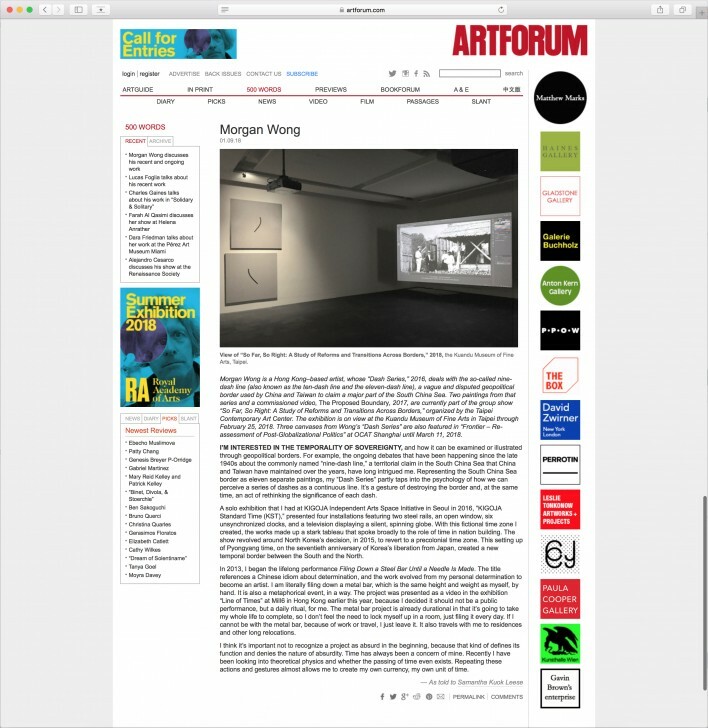 Wong’s work is also being displayed at a solo exhibition at this week’s Art Basel art fair in Hong Kong. Contrary to the blockbuster pieces on show at the sculpture display, Wong’s piece is subtle, and far removed from the main exhibition ground. Born in Hong Kong in 1984, Wong grew up in Tuen Mun, a satellite town that lies over an hour away from the city centre. For Wong, who was educated at an art school in London, time is an essential concept. He is inspired by the nature of time and the way that the past cannot be recovered, and his works are often produced through intensive, time-consuming manual labor. The time and effort he puts in, however, don’t always result in the most crowd-pleasing art pieces, and they certainly have yet to make Wong a superstar in the art world. 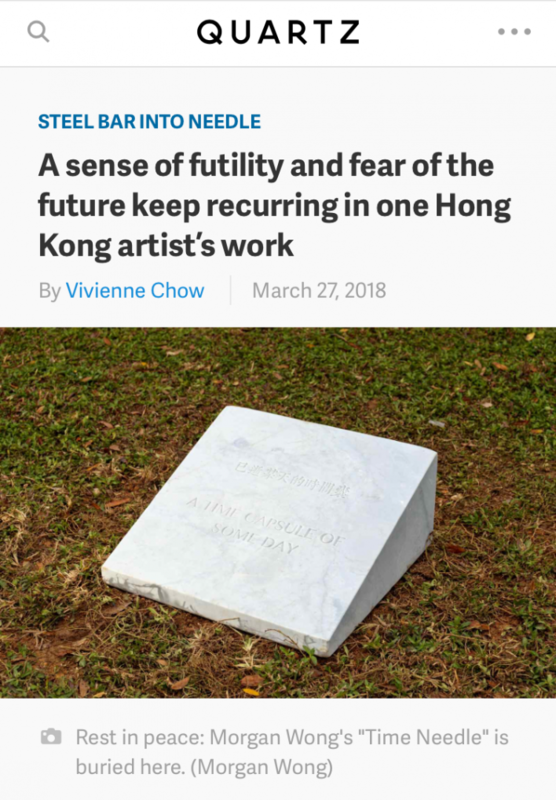 In that sense, his art reflects a reality as futile as the one for Hong Kong people waging their long battles for democracy and freedom—it feels just as unattainable as grinding down a steel bar into a fine needle. That feeling of despondency among Hong Kong people can also be illustrated by one of Wong’s earlier works, a video installation called Demolishing Rumour (2010). Inspired by a rumor of the demolition of Beijing’s arts district Caochangdi, a small screen showing a video of the artist smashing bricks is wrapped inside a structure made of bricks and concrete. No matter how hard Wong tries to break the bricks in the video, he is still trapped. A more recent 2014 work, The Remnant of My Volition (Force Majeure), exhibited at the Art Basel art fair in Hong Kong just months before the Umbrella Movement protests broke out, appeared to be a response to China’s desire to see Hong Kongers express more patriotism to the mainland. The bed-like installation was made up of white cushions embroidered like calendars, with the first date on them July 1, 1997, the day Hong Kong returned to Chinese rule, and the last one June 30, 2047, when Beijing’s promise that Hong Kong will remain unchanged for 50 years expires. The headboard had been covered by 50,000 Chinese national flag stickers that were peeled off to each reveal the indentation of a white flag—the symbol for surrender—underneath. Does Wong believe Hong Kong’s future is entirely hopeless? Wong shrugs. He says he wants to use Time Needle as a metaphor for the collective efforts of the people who made Hong Kong great, and that they should be remembered and honored. Having said that, Wong carries on grinding down the steel bar. 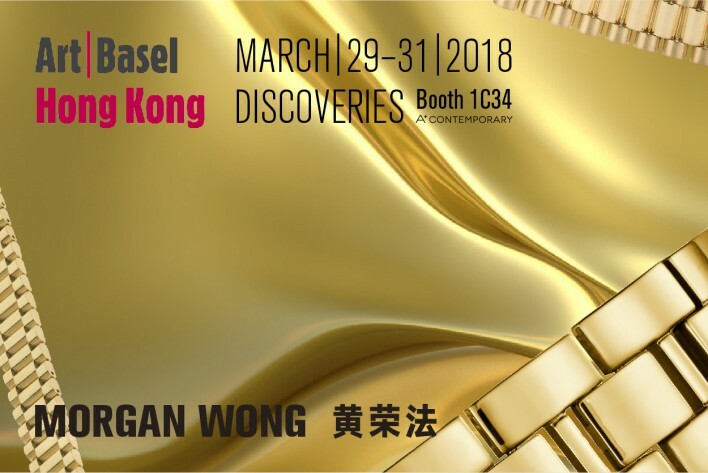 Morgan Wong’s latest work, “An Inch of Time; An Inch of Gold”, continues the artist’s investigations into time as a predicament. The installation includes two major elements: LED texts and absurdly proportioned, cheaply-made gold-plated wristwatches. The phrase ‘an inch of time for an inch of gold’ comes from a Chinese proverb addressing the immaterial nature of time, surpassing materiality. Wong’s endeavor to stop time by pouring concrete in watch-faces is obviously a wasted effort. The larger-than-life watches speak, nevertheless, to the materiality of time. A piece of real gold is buried in one of the watches, but this too remains as mysterious and irrepressible as the concept of time. The preciousness and the transcendence of the time, the cheapness of the watches, time’s immaterial nature and its materiality, therefore form various sets of paradoxical binaries, unfolding a multi-dimensional definition about time to the viewers. Discoveries, focused on solo shows by emerging artists, this year will feature 25 galleries. Highlights include Timur Si-Qin (b. 1984), whose virtual reality installation ‘Depolarization,’ presented by Société, beckons viewers into a simulated natural environment to pursue a spiritual relationship to matters such as truth, epistemology and climate change. At mor charpentier, Colombian artist Carlos Motta‘s (b. 1978) sculptures and photographs confront our preconceived notions of the natural and the unnatural. Hong Kong artist Morgan Wong (b. 1984) will transform A+ Contemporary’s booth with a semantic-filled installation comprising of blinking neon text and absurdly proportioned cheaply-made gold-plated wristwatches, continuing his exploration into the irrepressibility of time. At ROH Projects, Indonesian artist Faisal Habibi‘s (b. 1984) work will question the distinctions between sculpture, paintings and of art itself. At Various Small Fires, American artist Jessie Homer French (b. 1940) will present paintings of Western flora and fauna embedded within an allegorical and agricultural context, which were inspired by the artist’s rural life. Ali Kazim (b. 1979) will present an immersive installation inspired by his hometown of Lahore, resonating with the current political situation in Pakistan, presented by Jhaveri Contemporary. Artist duo ‘Pors & Rao’ will present a digital interactive booth at GALLERYSKE, continuing their survey on the autonomous side of human behavior. The BMW Art Journey will once more be awarded to an artist from this year’s Discoveries sector. For the full gallery list, please visit artbasel.com/hongkong/discoveries. Hong Kong’s first international sculpture park, Harbour Arts Sculpture Park transforms Hong Kong’s iconic harbourfront with artworks by established and emerging local and international contemporary artists. An unprecedented display of public art in Hong Kong, this free sculpture park of museum-quality works is curated by Tim Marlow (Artistic Director at the Royal Academy of Arts) and Fumio Nanjo (Director of Mori Art Museum and Director of International Programme at Hong Kong Art School), and offers a unique opportunity to experience world-class art against the backdrop of the Hong Kong skyline. Cementing the city’s position as a global arts player, Harbour Arts Sculpture Park is accompanied by a diverse and extensive programme of workshops and educational activities, demonstrating that art is for all ages and interests. Morgan Wong is a Hong Kong–based artist, whose “Dash Series,” 2016, deals with the so-called nine-dash line (also known as the ten-dash line and the eleven-dash line), a vague and disputed geopolitical border used by China and Taiwan to claim a major part of the South China Sea. Two paintings from that series and a commissioned video, The Proposed Boundary, 2017, are currently part of the group show “So Far, So Right: A Study of Reforms and Transitions Across Borders,” organized by the Taipei Contemporary Art Center. The exhibition is on view at the Kuandu Museum of Fine Arts in Taipei through February 25, 2018. Three canvases from Wong’s “Dash Series” are also featured in “Frontier – Re-assessment of Post-Globalizational Politics” at OCAT Shanghai until March 11, 2018. I’M INTERESTED IN THE TEMPORALITY OF SOVEREIGNTY, and how it can be examined or illustrated through geopolitical borders. For example, the ongoing debates that have been happening since the late 1940s about the commonly named “nine-dash line,” a territorial claim in the South China Sea that China and Taiwan have maintained over the years, have long intrigued me. Representing the South China Sea border as eleven separate paintings, my “Dash Series” partly taps into the psychology of how we can perceive a series of dashes as a continuous line. It’s a gesture of destroying the border and, at the same time, an act of rethinking the significance of each dash.